Chandelier in the bathroom? Très chic. Chandelier in the bedroom?. Oo-la-la. Chandelier in the kitchen? I'm undecided about that one. Jury, what say you? 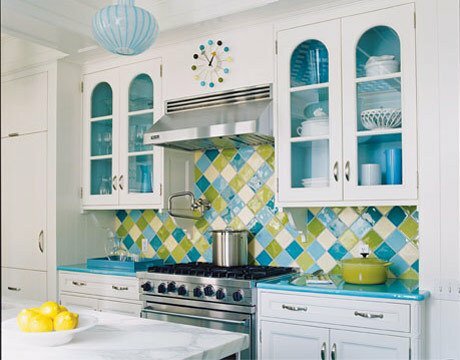 The black against that blue does pop in the kitchen pictured above. Want your curb appeal to grab attention? 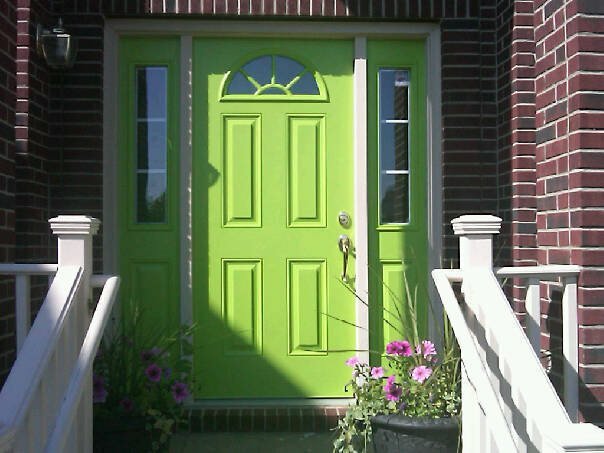 Paint your front door a kicky color. For inspiration, check these impressive entries. First up is an entry from Dalliance Design. The color choice is bold for sure, but what an impact, especially framed by that crisp white. Yellow is a happy color, no doubt, but it can also be a tricky color with which to decorate. Too much blue in it, and it can feel cold. Too much green in it and can remind you of that last head cold you had. Not good. Especially in a kitchen. These kitchens, however, seem to strike the right yellow balance. They're bright and happy, and not the least bit phlegmy. The first kitchen, pictured above, is served well with that fabulous wall paper. I've never been terribly fond of kitchen banquettes, but sometimes they are the best way to use space efficiently. It also helps if they're 'done' well. Here are six examples with a fresh, modern appeal that might have you re-thinking the banquette as well.